Raised Beds are boxes full of soil mixed with compost. Any vegetable can be grown in a raised bed, as long as the soil is deep enough for the roots. 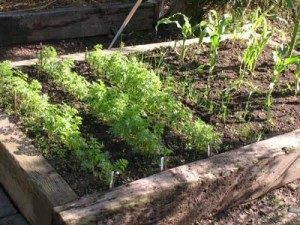 Raised beds are easier to manage because the depth of soil retains moisture and watering is not so critical. Also, raised beds don’t have drainage problems which means they have a big advantage in wet areas with heavy soil. Because the soil is well drained, it is warmer in the Spring, and veg can be planted earlier than in garden soil. The walls around the beds provide a barrier to slugs, snails and other pests. 1. Mark out the position of the bed. Any size will do – but they should be no more than 1.2m wide – so that you can reach in to the middle of the bed from either side. 2. Prepare the foundations, on which the beds will sit. A soil base is best so that water can drain away. The soil base must be firm and level. If the base has to be concrete, put drainage pipes and rubble at the bottom, to help drainage. 3. Collect the materials required. a. The height of the side can vary. It needs to be at least 15cm, but can be 30, 45, 60 or 76cm.. The higher they are, the less you have to bend! * wood – which will rot unless treated. Walls of 3m boards of 200 x 47mm pressure treated wood would last. directions – top, back to front and side to side – to ensure the wall is vertical. Leave gaps between the edges to ensure adequate water drainage. 4. 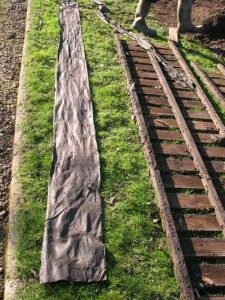 Fill the frame with about 7.5 – 10 cm of a mixture of peat, well rotted manure and topsoil, which can be purchased in bags, if not available. Dig this mixture into the soil below. 5. Make pathways of at least 60 cm between each bed. Check that the wheelbarrow can get between the beds. A clean path, with no mud, makes life easier. Duckboards are worth considering. 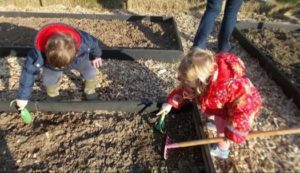 Small gravel or grit between each bed will deter slugs. If it all sounds too much Gardening Which Best Buy can be seen at Harrold Horticultural! 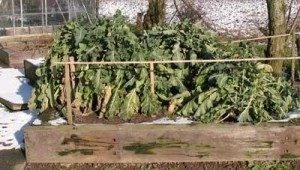 This related article on raised beds indicates the advantages of using raised beds.